Be prepared to promote your idea, your skills or your experience anywhere and at anytime. When you’re in line at Starbucks and someone asks what you do for a living, can you pitch them your brand or your company in 30 seconds or less? Always be prepared to deliver a pitch to anyone in any situation. Always back up your pitch with evidence, with facts and with stats. Always have a success story on the ready. Always ask for the sale….what do you want from the other person? Ask for their time, ask for an opportunity to discuss your ideas further, ask for something. Always get the other person’s contact information. Forget about handing out your business cards, they’re going in the garbage as soon as you turn your back. Get their contact information and then email them immediately. I mean, as soon as you walk away, take out your phone and email them. This will distinguish you from everyone else who will wait a “polite” amount of time to establish contact. Develop a pitch that’s so natural, so passionate, and so enthusiastic that your energy becomes contagious and people just “naturally” want to know more. Pitch, promote, discuss….these should all become a natural extension of who you are. 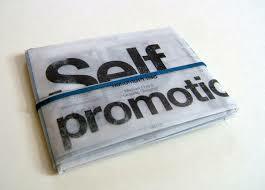 Promote to everyone, everywhere and at all times. Everyone is a potential client. Everywhere I go I talk about the power of confidence, & the sad truth of women letting their fears hold them back. I don’t start off the conversation with “me, me, me, I’m so awesome….” No. I start off with a powerful statistic (Did you know that women ask for promotions 85% less often than men?? And when they do ask, they only ask for 30% less than their male colleagues!). This engages people, they want to hear more, so I give them more, all in an articulate and thoughtful and passionate manner. And if they don’t ask, I tell them what I do for a living, I tell them I have a book coming out on this very topic. I ask if they have a daughter or a sister who struggles with self-confidence. I keep the conversation going. That’s how you self-promote. and I’m not going to feel badly about it. Promote your skills and experiences in the classroom or one-on-one with your professor or managers. Promote yourself in work meetings. Take every opportunity to showcase your RESULTS, your accomplishments and then ask for more. A better assignment, more responsibility, more challenging projects, Ask to be a team leader. Just remember to always organize your skills, talents and experiences around what VALUE you ADD to the company or project you’re discussing. It’s always about blending your unique talents and skills and pitching them as invaluable to your boss, your new client or job prospects. It’s about your skills PLUS the value you add. That’s the synergistic power of promotion! Sociologist. Professor. Author. Guest expert on CTV's The Social. Apology-hater. Confidence-builder. I hate the word humble. Get all the latest posts delivered to your inbox. © 2014-2017 ALL IN Inc.